You are looking for a Brittany holiday home, then you are right here. We have a large selection of personally arranged private holiday homes where you can enjoy an unforgettable holiday by the sea. With us you will find a large selection of personally arranged private Brittany holiday homes, where you can enjoy an unforgettable and pleasant holiday by the sea. Whether you are looking for a romantic holiday home for a holiday for two, want to spend a beach holiday with children on a family-friendly beach, or relaxing holiday in a quiet beach location; Whether you are planning your holiday with a dog, living in a typical Breton fisherman's house or looking for a modern holiday home by the sea, a great town house with nice amenities or a stone house in a secluded location, everyone will find happiness in our holiday home offer. Since we have lived on the Crozon peninsula for a long time and have years of experience in renting a holiday home, we are able to advise you personally and competently, not only before, but also during your holiday. Returning Brittany holidaymakers, personal relationships with the landlords and our own enthusiasm for Brittany keep motivating us to keep working alongside us, providing new information on the holiday destinations of Northern Brittany and South Brittany To provide you and to offer very nice holiday objects according to your criteria. We always answer your request on the same day with personal advice according to your holiday wishes. If you can not find a suitable holiday home in our homepage, you can contact us by phone or send an inquiry via the inquiry form of a holiday home. We will then send you the free objects as soon as possible by e-mail. Take a look at our site more often, the information will be constantly expanded and improved. Brittany is still not a mass tourism destination, it is not the place to spend days on the beach, it is more of a region for individualists who want to discover culture, the mysticism of legends, the story of King Arthur in the Woods should have searched for the holy grail; who want to fathom the mystery of the menhirs and sunken cities and the Breton soul. Many artists, such as Gauguin, Boudin, Matisse and Picasso were already inspired by this region, by the radiant colors of the sea, the strong contrasts between loveliness of the heathland and the hardness of the granite rock. Even today's writers, such as Jean-Luc Bannalec, are inspired and delight the Bretagne lovers with thrilling thrillers and the cases of Commissioner Dupin on the Breton coast. 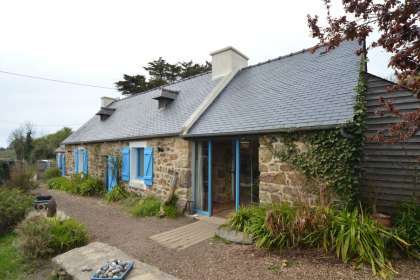 Exceptional Brittany cottage on the west coast of the Crozon peninsula. This Breton former fisherman's house was restored with great attention to detail, the furnishings and decorative materials were collected for years and artistically integrated into the house, it is a true oasis for Brittany lovers. 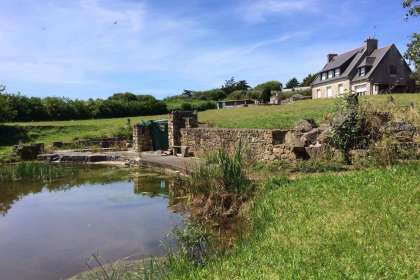 Fantastically located holiday home in a secluded beach location, just a few minutes walk to the long beautiful sandy beach Lostmarc'h, one of the most famous surfing beaches in Brittany, located on the west coast of the Crozon peninsula. The house is surrounded by a huge beautifully landscaped, naturally closed property with private pond. A paradise for those who love nature and absolute tranquility. 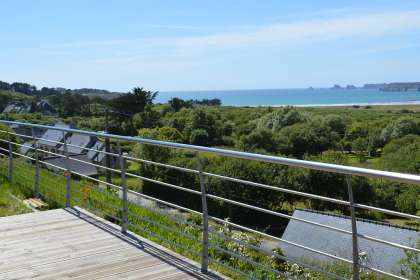 Brand new, ecologically designed, very comfortable house situated on the prettiest west coastline of the Crozon Peninsula. The location is an absolute dream, only 800m. to one of the best beaches on the peninsula, Plage de Goulien. 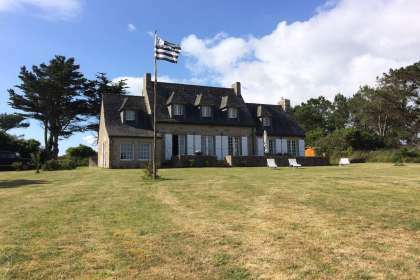 Beautiful large and wonderfully equipped Brittany villa with sea views in an exceptional location in the middle of a 1.6-hectare property without neighborhood in the Finistère on the beautiful Crozon peninsula, on the Cap de La Chèvre. Very nice holiday home, a brand new woodhouse in Penmarch in Southern Brittany, only 0.6 km from the sandy Pors Carn beach and 3 km from the Point of La Torche. Sleeps up to 8. Non smoking residence, Child-friendly, Domestic animals allowed . 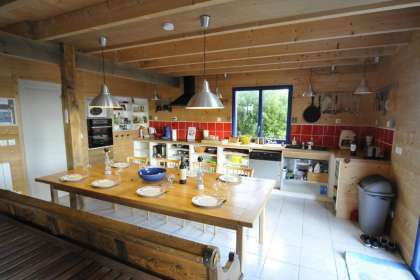 The holiday home Chez Le Biso in Penmarc'h is tastefully decorated, the pool in the garden is heated, the beaches Pors Carn and La Torche are nearby, they belong to the best surfing beaches in Brittany.